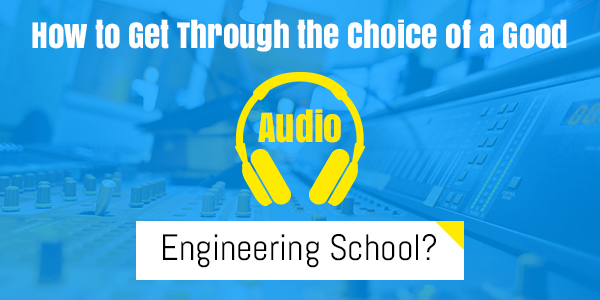 How To Get Through The Choice Of A Good Audio Engineering School? Do you feel like entering into a completely new world every time you connect yourself with the soundtracks? Does time just flew by whenever you play with sounds, recording, mixing and recreating some new tunes? And, you often refer as the life of parties and celebrations because of your passion for music? Then, career selection is simply not an issue. You can look forward to a career into audio engineering where you can enjoy your work with the rhythms you love. Like every other career, you need some educational qualifications for a career into audio engineering as well. And for right educational guidance, it is important that you find a right institute or school. The pool of options may make you feel confused about making a final selection. Questions like where to go for finding complete information might tinker your head. To get rid of all such stressing conditions, you should try referring to some genuine sources to seek some reliable advice. These sources could include references from web, family, friends or a self-evaluation by physically visiting them. One of the finest ways to get through the confusion of choosing a good audio engineering school is to get ready for some tours in the city’s best schools. Though you can take virtual tours online, but it is always preferable to visit schools personally. The workable strategy here would be – sort out a list of accredited institutes that have maintained a track record of satisfied students and experienced instructors preferably those who are connected with the audio engineering industry. Be sure to ask as many questions you can ask about programs that a particular school offers duration, career opportunities and any other question that might be stressing you out. Don’t forget to consult your best friend: Google. Just be online and dig in thorough research about any school or program you are interested. And, if you want to start it all from the scratch, look up for some names of the best audio engineers. Researching their histories and career path would help you get better guidance. Many of the industry personnel even provide contactable email ids through which you can clear all your doubts directly from the professionals. Once you are done with research, you will definitely get some good choices in hand. Remember: Gone is the time to hesitate. Once you just realised that you want to make a career into audio engineering, you tend to make a good start. It is no doubt a very rewarding career, but consumes too much of time, needs you to be immensely dedicated and also demands financial investment. The career of audio engineering is more of customer satisfaction based – you need to be well-versed with the technologies involved so that you can put the best sounds together and make people dance on your tunes. Kaylyn Gabriele is an online blogger who is living in Canada. All her researches are based on the career options like audio engineering Canada, animation etc so to educate upcoming artists about the exciting opportunities, following their passion. Connect with her on Twitter. Previous : There Are Many Versions Of Damp — Do You Know Which One Is Affecting Your Home? Next : 6 Amazing Mehndi Styles That Are In Craze!